A fellow photographer (nobody I know) crouches down at the event to get a different view point. I got the impression that he was very well prepared for the event and had high stamina. His stance looks a little sub-optimal to my inexpert eye. Ayush Basu: I cannot talk about the other aspects of this stance but it is certainly not good for the soles of shoes - I tried once and the soles cracked at the edges to release the stress, Ray. Ayush Basu: He was well prepared, Astrid. I get the feline feeling from him. Ayush Basu: Somewhat alert and cat like, what I thought, Lisl. Ready to jump and capture the image Ayush...Well spotted! Il se met à la hauteur de l'évènement. He even has a safely vest along with his nice lens. He seems quite confident using his SLR with just one hand; I can't even do that with my compact camera. It is surprising just what difference a lower viewpoint can make. Nicely captured. It doesn't look very comfortable to be crouching like that. A low viewpoint makes a good change sometimes, but one hand only holding the camera, a no-no for me!! Ayush Basu: I agree with you, Brian and also I agree with you! 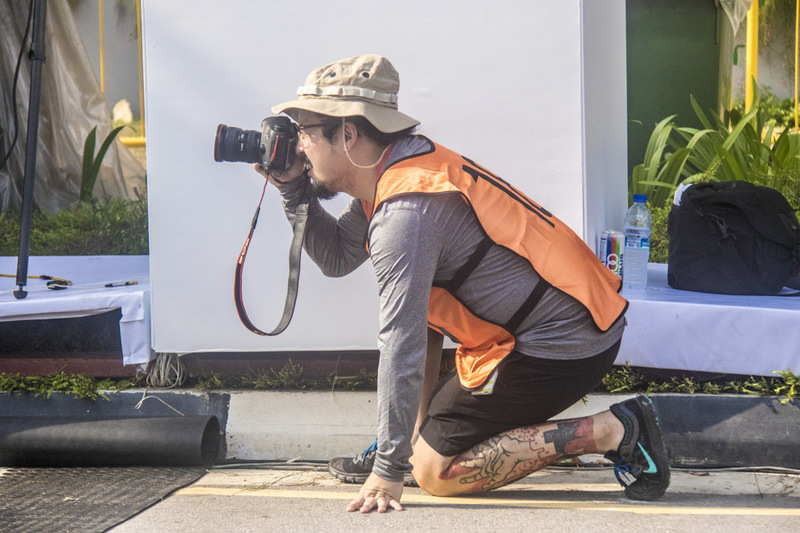 Earlier this June, I had the opportunity to shoot tennis matches and a little less than two kilos is not good on one wrist (crouching or whatever position)! Ayush Basu: Yes I remember you mentioning that. I do tend to take shots from a crouching position but not for long, Peter. I thought it was the start of the 100 meter event for photographers! Ayush Basu: Haha, good one, Tom. I would not get twenty meters with my gear. A fine capture... I especially like the tattoo with the hand reaching to his hand. Ayush Basu: Thank you, Jacquelyn. This was very much an on-the-spur shot, so I am satisfied it came out decent. A very nice catch! Odd tattoo! Ayush Basu: Yes, Elizabeth, I don't recall much about it but it certainly was quite visible. Anyone with a "red ring" is serious when it comes to photography, Ayush. Trust me.